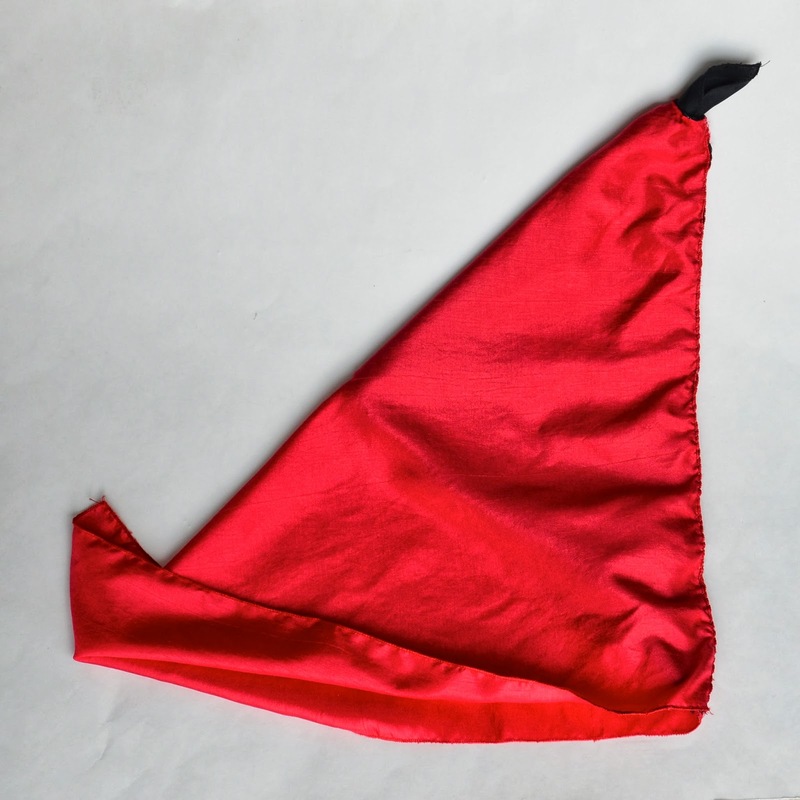 Here is Handmade Christmas Gift #2: a magic handkerchief ("which is also fabric, so it's not true what you said in the Skirts post that the skirts were the only fabric gift," Emily pointed out to me today. Nothing like having your own kid edit you on the internet). Emily is into magic and illusion now. She's also into origami, that Rainbow Loom thingy, spy codes/ciphers/detection, mental puzzles, and electronics. I can barely keep up. Case in point: last month, she came home from school with instructions for a science project on Sound Waves. Everyone had to turn in some kind of demonstration of amplitude/volume and frequency/pitch, so things like water columns, straw chambers, duck reed pipes etc. would've been perfect. Emily, however, wanted to do electronics. So I wrote "transducers" on a slip of paper and sent her off to do research, all the while thinking, "Er... isn't 3rd grade a bit early for electronics?" Then kicked myself - if that's her thing, and she's interested, who am I to get in her way? Long story short: she brought her Snap Circuits stuff to school, along with some Radioshack bits and bobs that she found in my electronics scrap drawer (why, yes, I have one of those - it's where all our flashlights go to die) and did her presentation. That's one side of Emily. And here's another: magic and illusion. Long ago, I made that top hat with the secret compartment for the girls' dress-up box. 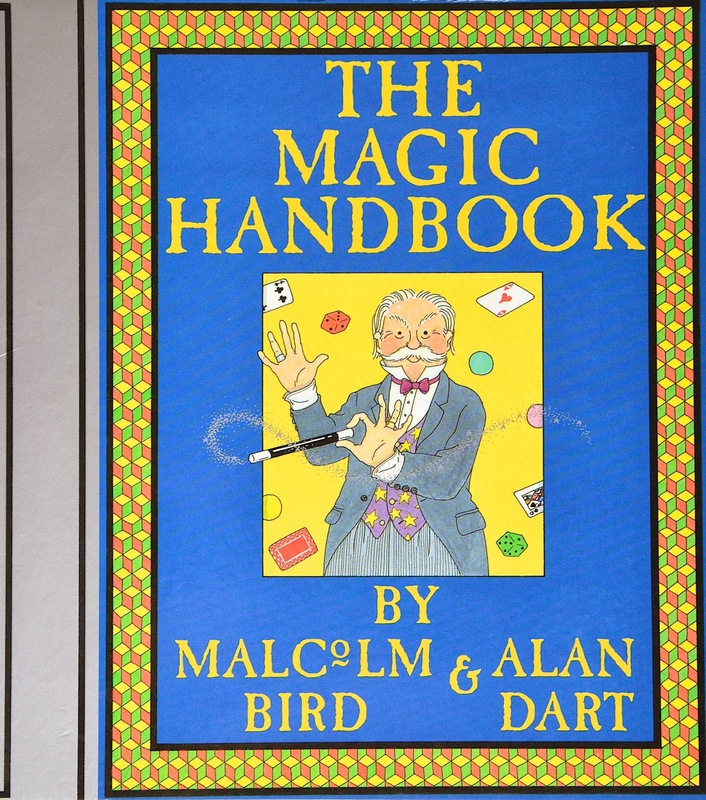 They've loved it, and wore it until their heads outgrew it, but it still turns up in their magic shows at home. Over the last couple of years since Emily has really gotten into illusion and magic, she's collected quite a few trick items and supplies. Also books, like this one. One day, I was flipping through the pages and thought I'd make her a couple of things from it for Christmas. 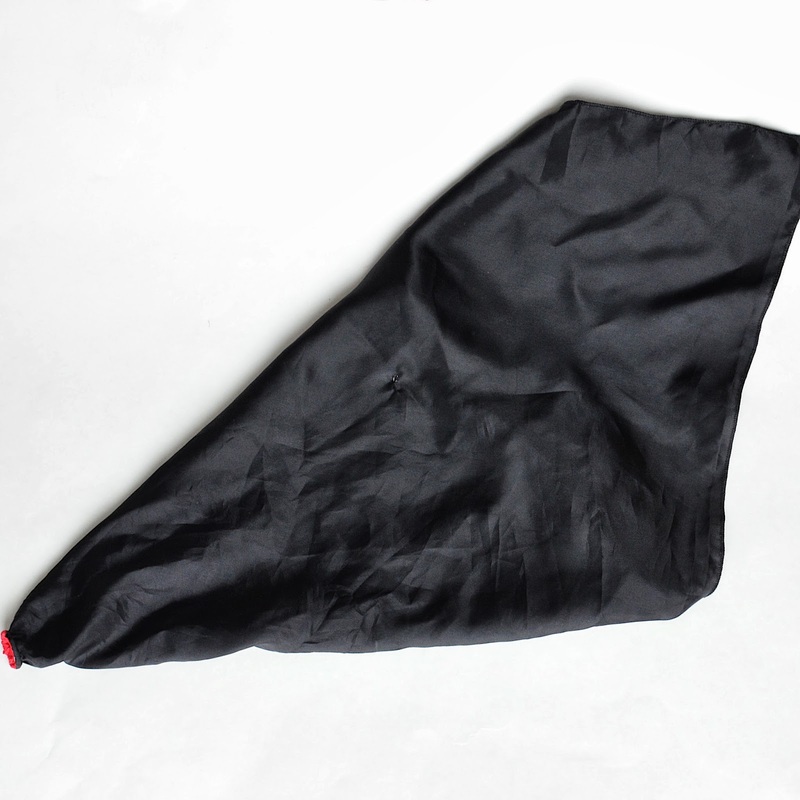 This one is a color-changing handkerchief. Super easy, but there is some hand-stitching involved. Here's the tutorial. I made one change to the instructions, but otherwise, it's the same as in the book. 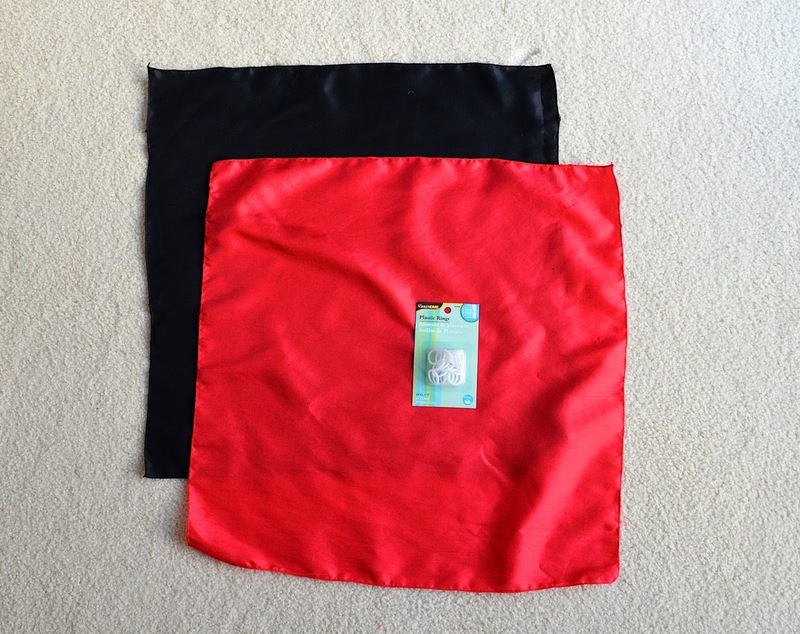 Two 20" squares of thin, slippery fabric that has no discernible RS and WS. The book recommends silk, which is of course superior. I don't happen to have silk lying around in my fabric stash (who does, really? 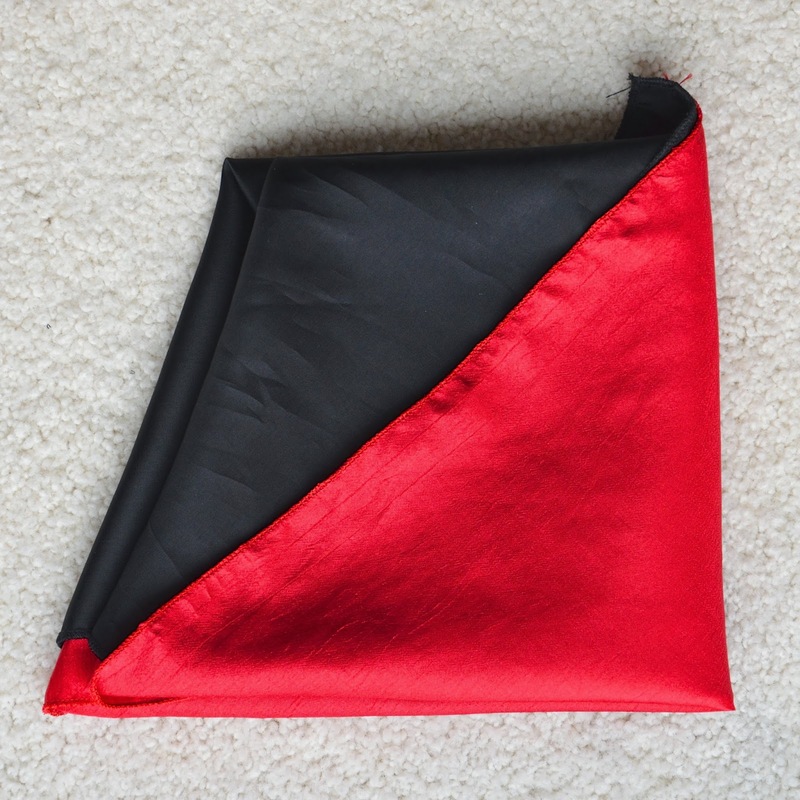 ), so I used some crepe thing (the red) and some good polyester lining (the black). Or you could buy silk scarves and dye them. Finish all four edges of both squares- I rolled-hemmed them on my serger. 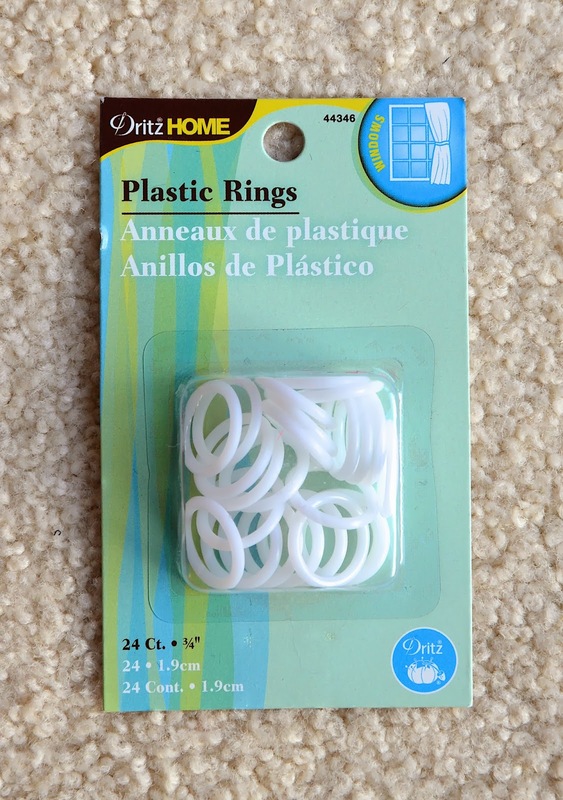 Warning: The book recommends curtain rings, of this size (see photo below) but I found them to be far too small. I actually finished sewing the handkerchief system, plus all the tutorial photos, then tried to change the color according to the instructions and found that the fabric got stuck in the ring. Then had to unpick the ring out and insert a larger one. I'd say use a 1"-1.25" ring, especially if your fabric is thicker than silk (and most are). I used one of those cheap key rings that you can buy from hardware stores - the metal ones that are two coils stuck together that you slide keys on by squeezing them between the two coils until they pop into the ring itself. So, first place both squares with their RS together, and line up their edges. Depending on the diameter of your ring (mine was 1") measure about 3" from one corner along both edges, and draw a quadrant-arc. 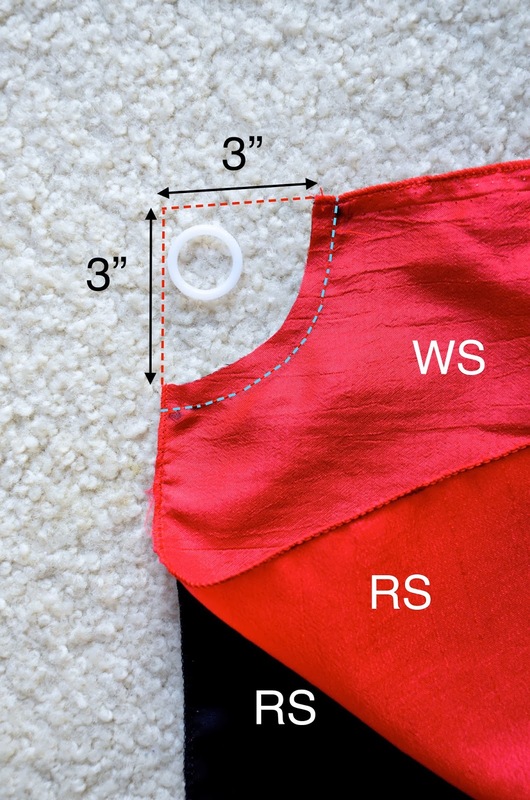 Sew through both layers along that arc, then snip and trim the SA to 1/8", unless your fabric frays copiously, in which case just leave it at 1/4". Spread the two squares apart (they will be joined at that trimmed corner) and slide the ring on, positioning it at the junction of the two colors. 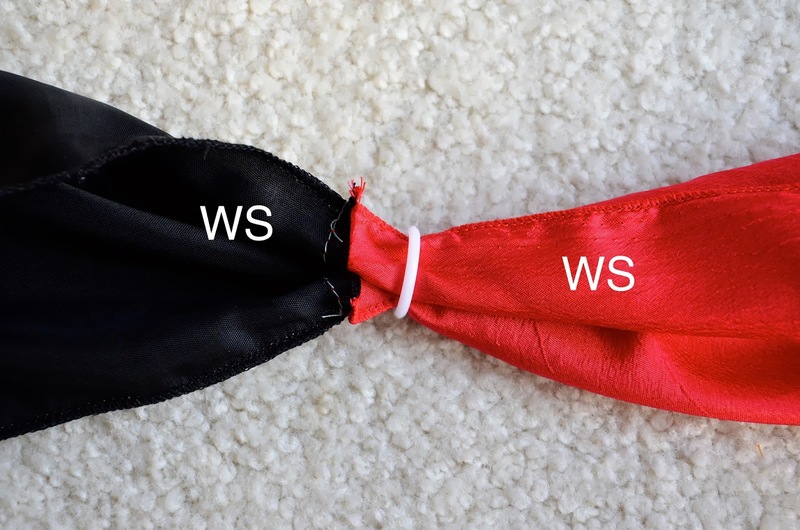 Bring the WS of the handkerchiefs together so that their RSs face out, hiding the SA of that trimmed corner, and the arc encloses most of the ring (seen peeking out at black arrow). 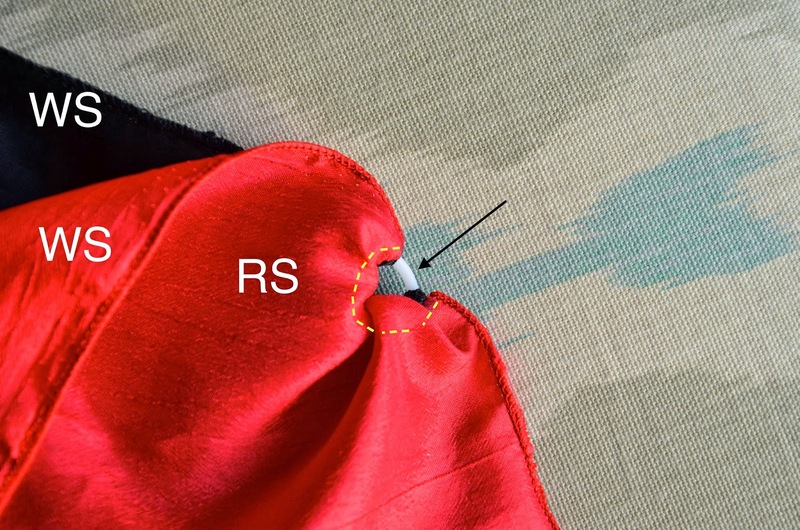 Hand-sew small running stitches (yellow dashed lines) around the ring, through both colored fabric layers, to completely enclose the ring in a tight channel. 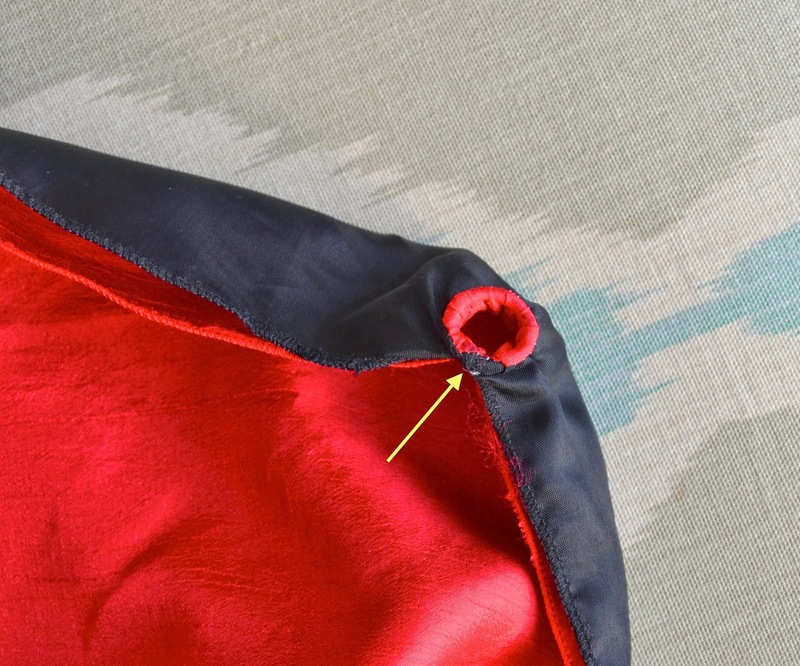 You should also stitch across the gap between the edges of the handkerchief so that the ring is totally covered by the fabric (yellow arrow). In the next two photos, I've deliberately over-turned-out the red fabric to the black side to show the position of the ring; normally, you wouldn't see the contrasting ring-shape. 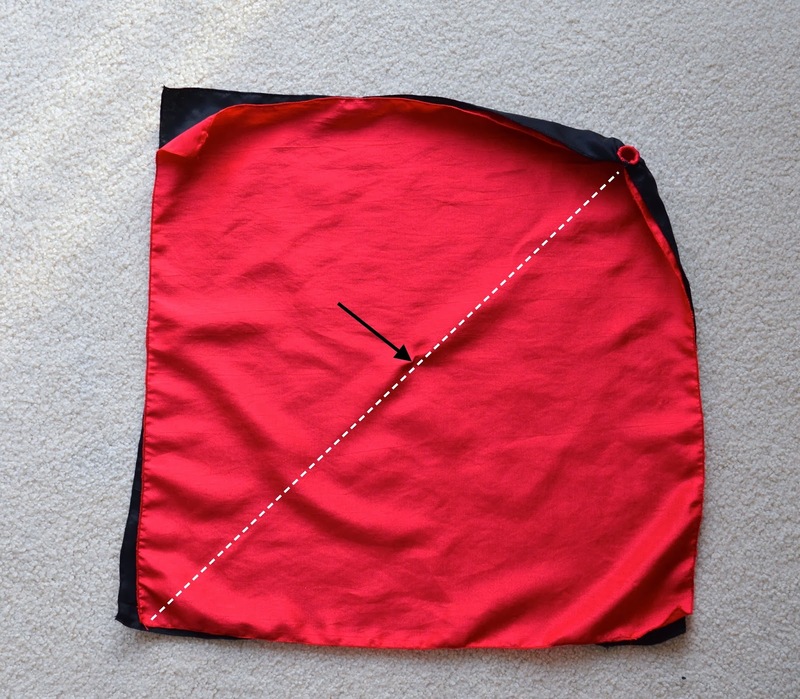 Using a few stitches, securely sew both layers together at the middle of the square (black arrow). This is important because it allows the handkerchiefs to completely turn inside out on themselves to make the trick work. 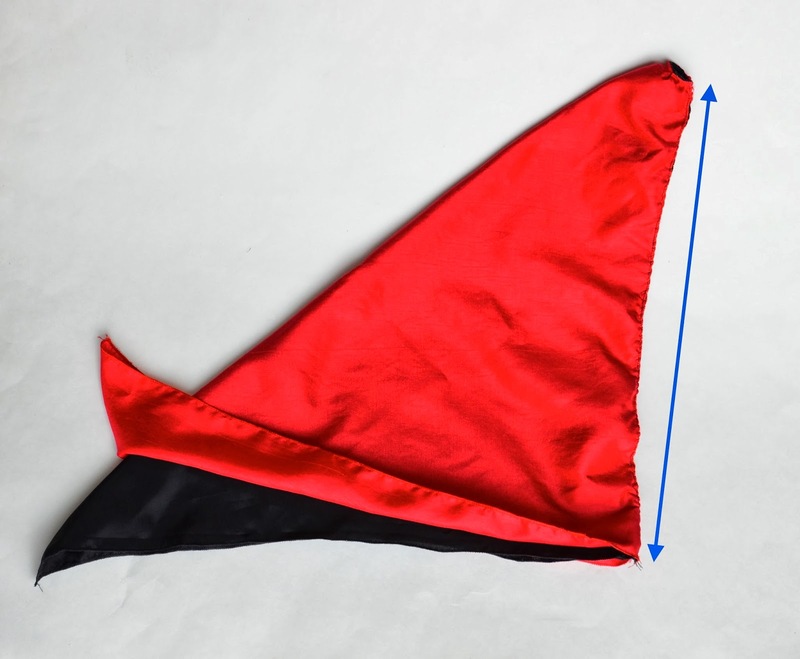 Now fold the entire handkerchief system along its diagonal (white arrow), with the ring at one end of the diagonal as shown, and whip-stitch along the edge shown by the blue arrow. Stitch through all four layers. 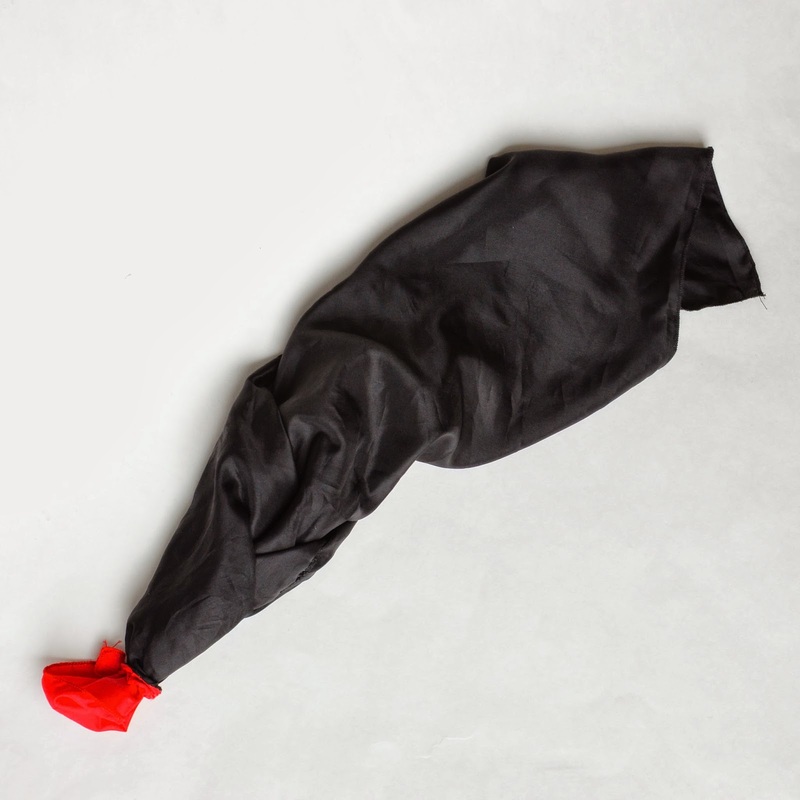 It doesn't matter whether you fold red over black or black over red (or whatever colors you're using). The magic handkerchief is completed! Now, do some magic. Working with the INNER layer (in this case, black), take the corner farthest from the ring and thread it through the ring from the inside of the handkerchief system system. Hold the ring area with one hand and pull that corner (black) through the ring with the other. The outer layer (red) will fold inwards on itself as it follows the inner layer (black) through the ring. Ta-da! 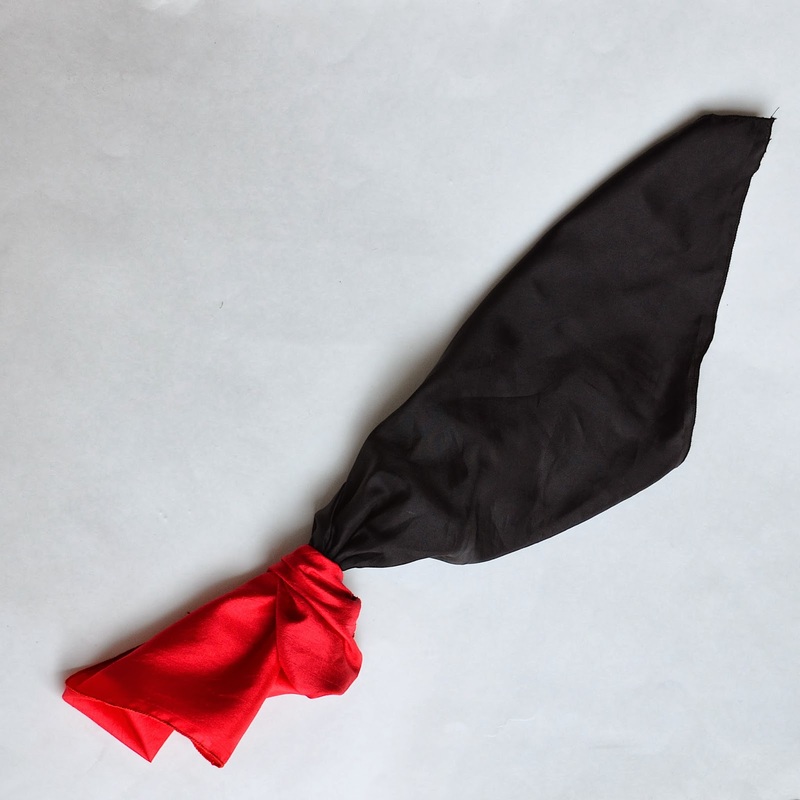 The handkerchief has changed color from red to black! Next up: Emily's Magician's Table, and it's cardboard (but, okay - and this is to satisfy the fact-checkers -it also has a bit of fabric). So fun! Mike was VERY into magic as a kid, and his mom still has a solid wood magician's table that is grandfather made him. He still uses some of the tricks he learned to entertain our kids and their friends. I'll have to remember your tutorial if/when my own kids get into playing magician!